Pope Benedict XVI will visit Scotland in September as part of a four-day UK tour at the invitation of the Queen, Buckingham Palace has confirmed. The head of the Roman Catholic Church will be received by the Queen, Supreme Governor of the Church of England, at Edinburgh's Palace of Holyroodhouse. 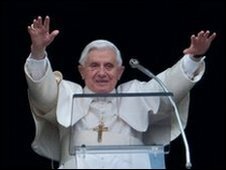 The Pope will also hold a public mass in Glasgow. The visit from 16 to 19 September will be the first Papal tour of Britain since Pope John Paul II's in 1982. It is will also be the first ever official Papal visit to Britain. The 1982 trip was a pastoral one. Pope John Paul II six-day trip to Scotland included a mass in Glasgow's Bellahouston Park, attended by almost 300,000 people. Cardinal Keith O'Brien, Archbishop of St Andrews and Edinburgh and President of the Catholics Bishops' Conference of Scotland, said he was "thrilled that the Pope has accepted the UK government's gracious invitation". "I am sure he will receive a heartfelt welcome from Catholics as well as members of other faiths and people of goodwill," he said. "A defining feature of Pope Benedict's teaching has been to remind Europe of its Christian roots and culture and to give us guidance on the great moral issues of our day and it is my hope that we all open our hearts to his words." First Minister Alex Salmond said the Scottish government would play its part to ensure the visit was "a successful and memorable event". "I warmly welcome the announcement that His Holiness will travel to Scotland this September and visit Edinburgh and Glasgow," he said. "The Papal events in 1982 were an enormous success and this visit will be a wonderful occasion for the whole of Scotland." Scottish Secretary Jim Murphy, who is leading UK government preparations for the tour, said it was "an historic visit at an important time". "The Papal visit represents an unprecedented opportunity to strengthen ties between the UK and the Holy See on action to tackle poverty and climate change as well as the important role of faith in creating strong and cohesive communities," he said. "We aim to build further on the positive relationship we have developed in recent years." During the visit the Pope will beatify the 19th century theologian and educationalist Cardinal John Henry Newman at a public mass in Coventry. He will also conduct a prayer vigil in London. He will meet the Archbishop of Canterbury, the head of the Church of England, at Lambeth Palace and pray with other church leaders at Westminster Abbey. More details of the Pope's itinerary will be released closer to the time.